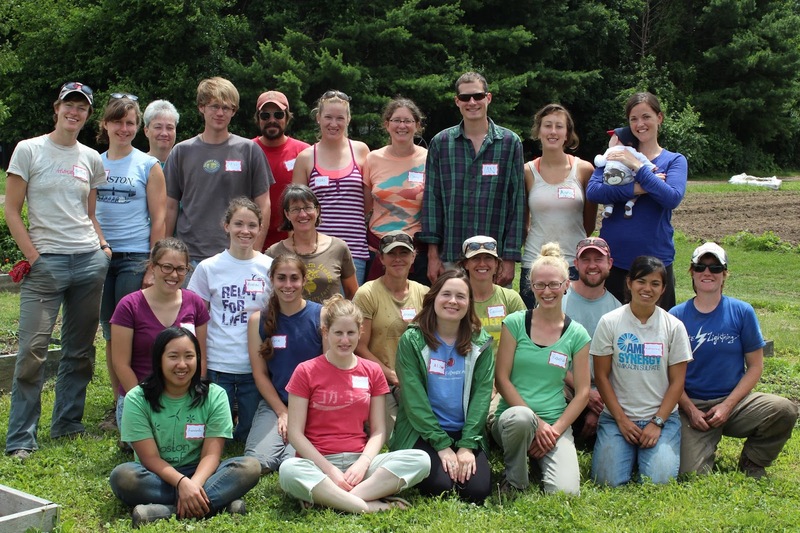 This summer, I worked on the weed crew at Waltham Fields Community Farm. Kale. Harvest from the bottom up, and it continues to grow and produce new leaves! a variety of flowers, and much more. I saw okra growing for the first time, too! The weed crew position was part-time, Mondays - Fridays from 8 am - noon, from June - August. The crew consisted of four members, and from Tuesday - Friday we worked with drop-in volunteers, from 9 am - noon. It was great to meet and to work with volunteers of different ages and backgrounds! Most of the work that we did was by hand, and we occasionally used hand-tools. The weeding we did ranged from detailed work such as weeding carrots, to weeding weeds that were taller than me (I am five feet tall). One great benefit of the job was receiving fresh produce from the farm. 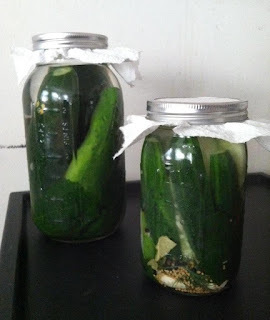 I fermented both pickling and salad cucumbers using the recipe from the book Real Food Fermentation (a book that I contributed writing to), and both batches of fermented pickles came out very crispy. I had grape leaves on hand to add to the fermenting jars as well, which are supposed to help pickled cucumbers to keep their crunch. Other ways I preserved the harvest included making sauerkraut and a variety of pestos, freezing, and canning tomatoes with other members of the weed crew. To make the tomato sauce, we modified a recipe from Pick Your Own, took the appropriate precautions in order to avoid botulism, and with three people, six hours of work, and a water bath canning set, we had canned 10 pint jars of tomato sauce. Despite Waltham Fields Community Farm's abundance of tomatoes this year, this has been a tough tomato year for some farms in the area because of late blight. Late blight appears sporadically in the northeast, and unfortunately returned this season. Also known as "Phytophthora infestans," late blight caused the Irish Potato Famine in the 1840s, and it infects tomatoes and potatoes. If late blight is not managed, it can destroy entire crops in days. While some farms in the area lost crops due to late blight, others who have been able to manage the disease have had a very productive tomato season. Read more about late blight in this handout, and for photos and for more information, visit this webpage. Another crop we weeded was parsnips, a crop that we needed to weed in long pants, long sleeves, and gloves! Why? Because parsnips contain furocoumarins, a photosensitive compound that can cause phytophotodermatitis. If the plant juice from parsnips gets on your skin and the skin gets exposed to sunlight, it can cause serious burns and blisters that can last even up to a year. Although many people are already familiar with these burns from wild parsnips, the burns can occur with cultivated parsnips, as well. Luckily we were warned about the dangers of parsnip beforehand! For more information and pictures regarding parsnips burns, check out these articles: "Burned by wild parsnip," "Parsnips gave me blisters! Gardener covered in sores after brushing against vegetable leaves," and Parsnip Dangers from Wikipedia. Over the summer, I also attended several meetings with Emasscraft, the Eastern Massachusetts Collaborative Regional Alliance for Farmer Training. "CRAFT is a free, collaborative group...From April through October farmers, farm workers and apprentices from CRAFT farms gather at one farm for a visit and/or workshop. Each visit includes an overview of the farm as well as a discussion about one or two specific topics. CRAFT discussions are also scheduled November through March if there is sufficient interest" (http://emasscraft.org/wordpress). I went to three CRAFT meetings this season. At the meetings, I learned about weed management techniques at Drumlin Farm, tomatoes at Wright-Locke Farm (a farm that I also wrote an article about for the Lexington Farmers' Market), and irrigation systems at Moraine Farm. I enjoyed visiting new farms, and seeing how each farm operates differently from one another. The schedule for Emasscraft meetings can be found here, and I would highly recommend signing up for their listserv. It was a great summer working on the weed crew, and also with the wonderful staff at the farm. Although I am sad to no longer be working at Waltham Fields Community Farm, I am looking forward to sharing a winter CSA with some of my fellow weed crew members this winter. Waltham Fields Community Farm's annual Waltham Farm Day is also coming up on Saturday, September 22! 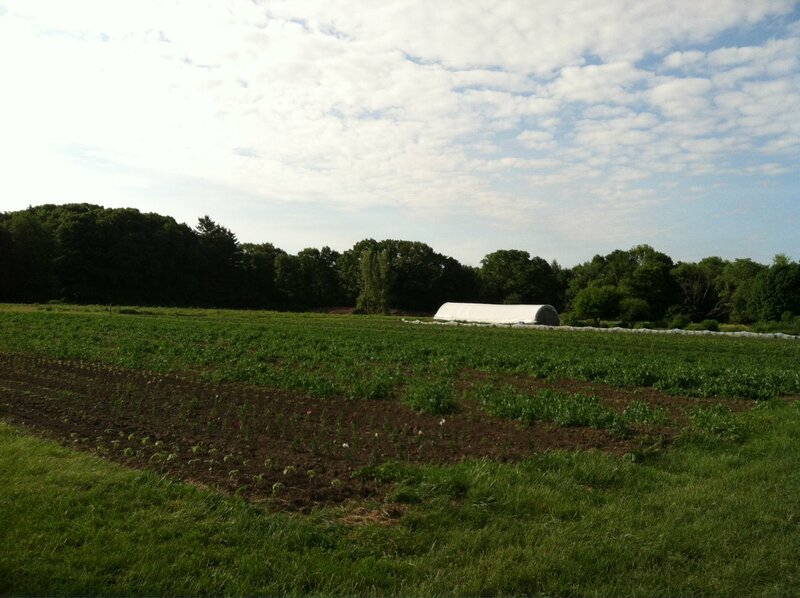 For more information about Waltham Fields Community Farm, visit their website. I am also excited for some new opportunities that are coming up. I will be participating in Goldthread Herb Farm and Apothecary's Farm to Pharmacy Intensive this September 22-28. This week I also begin working at Blue Heron Organic Farm in Lincoln, and in addition to my waitressing hours at the Spanish wine and tapas restaurant Taberna de Haro, I will be working as a cook. Stop by the farm or the restaurant sometime and say hello!